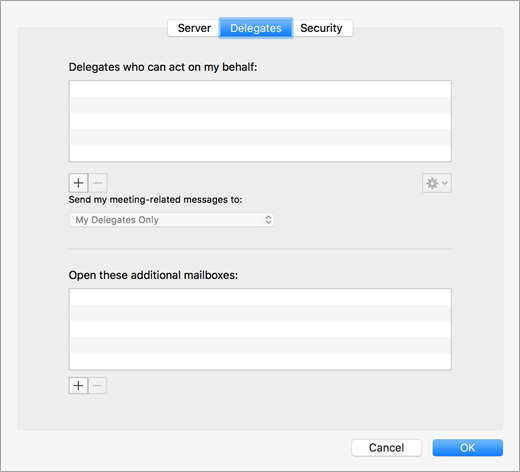 Choose the appropriate option depending on whether the mailbox is shared with you or you are a delegate for another user's mailbox. When you use any of these methods, the shared mailbox account is added as an option in the From field when you compose emails. This lets you select the account in the From field regardless of whether you have permissions to send from this account. If you do not have "Send As" or "Send On Behalf of" permissions for the account, email from the account will not be sent. 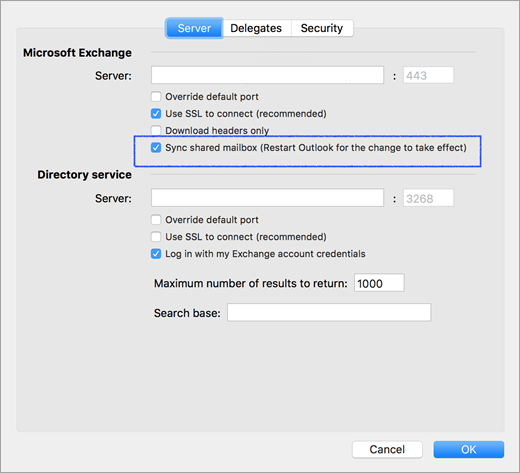 Outlook for Mac does not support Auto-mapping of shared mailboxes. If another user has shared an inbox, primary calendar folder, or primary contact folder with you, use this method to open the user's folder. Use this method if you are a delegate for another user's mailbox or when you have permissions to several folders in a shared mailbox. You can also use this method when you have full access permissions to a mailbox. On the Tools menu, click Accounts > Advanced > Delegates. Note: If you have permissions to custom folders in the mailbox but not to the top-level mailbox folder, the custom folders will not appear in the folder list. Only default folders that you have permissions to, such as Inbox, Sent Items, Deleted Items, and Calendar, will appear in the folder list without top-level mailbox folder permissions. When you have Full Access permission to a shared mailbox—that is, Full Access permission of a mailbox set up through Exchange Admin Center (EAC)—you can add the shared mailbox with your own credentials. Click the Plus Sign to add an additional Exchange account. In the E-mail address field, enter the email address of the shared mailbox. Under Authentication, enter your own credentials. Note: To see how to set up Full Access permission, see How to grant Exchange and Outlook mailbox permissions in Office 365 dedicated. Checking the setting Sync shared mailbox will allow Outlook to synchronize the shared mailbox without requiring the user to click Send/Receive. This setting was added in version 16.13.411. Enabling this setting is highly recommended for users who use their own credentials to access a shared mailbox. The following table summarizes the permissions options that may be available for a shared folder or mailbox, and the best method for opening the shared folder or mailbox based on the corresponding permission. Click the plus sign and then click New Account to add an additional Exchange account. Under Authentication, enter the credentials for the shared mailbox.